Tanzania is the ultimate safari destination. And a safari in the Serengeti National Park (Tanzania’s first and most famous national park) and the Ngorongoro Conservation Area (where you’ll find the spectacular Ngorongoro Crater) is the best of the best and the reason a lot of people choose to visit Tanzania in the first place. Forget the Lion King, this is the real thing. These areas are also home to the annual wildebeest migration and when you see this spectacle, you will really understand the meaning of the circle of life. Think vast open plains, spectacular scenery and all the animals of your dreams. Lions, hyena, leopards, elephants, giraffes and zebra roam the savannah, locked in a constant battle for survival. It’s fascinating and humbling in equal measure. I’ve been to the Serengeti & Ngorongoro Crater 5 times (I’m about to go for the 6th time in a couple of weeks), at different times of year and each time it has been spectacular and unique. 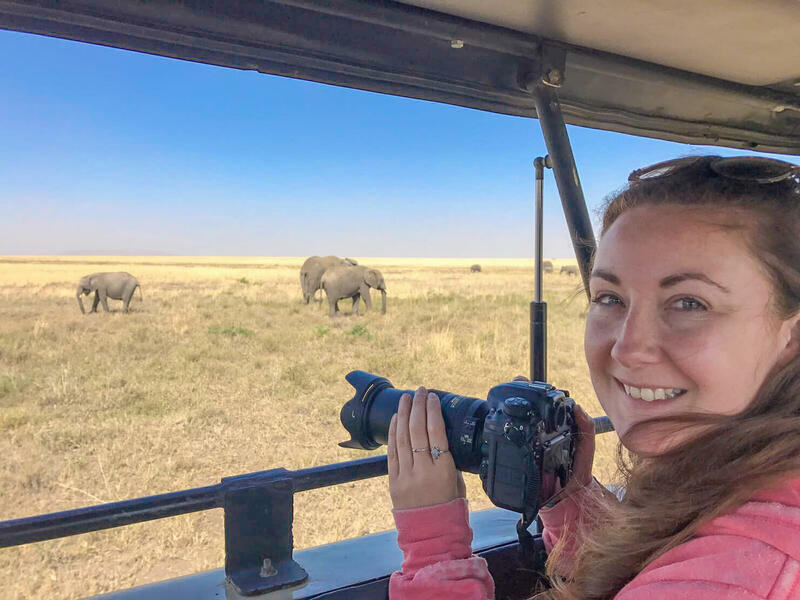 But choosing a safari can be a little daunting as there are so many options and costs vary greatly, so you’re probably wondering how to pick the right one for you. 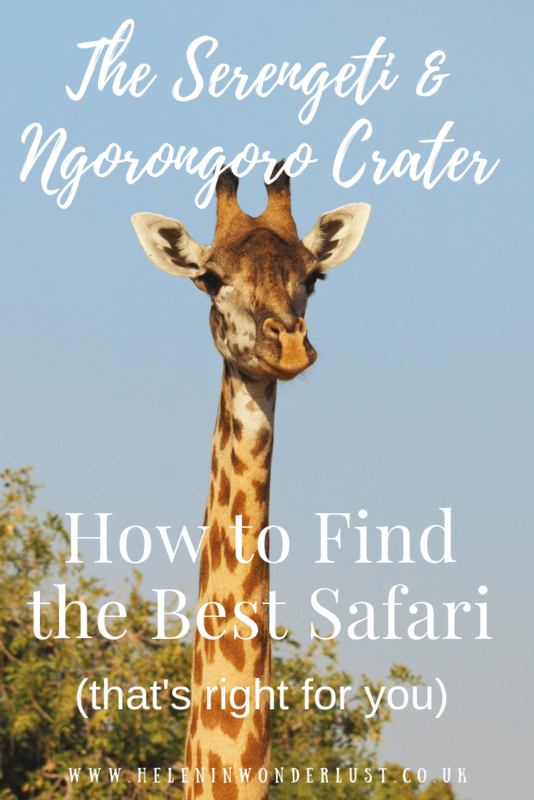 So I want to explain a little bit more about the various packages and what you get so that you can decide which Serengeti & Ngorongoro Crater safari is right for you. The best time to visit both the Serengeti and Ngorongoro Crater is generally said to be between June to October and January to March, although prices are higher as it’s peak season. June to October is the cool, dry season so the animals tend to be easier to spot. June and July are good months for viewing the wildebeest migration, especially if you are on a budget or mid-range safari, as this is when the herds are in the most accessible parts of the Serengeti. This is also the busiest time of year. Nights are cold, especially on the Ngorongoro Crater rim. 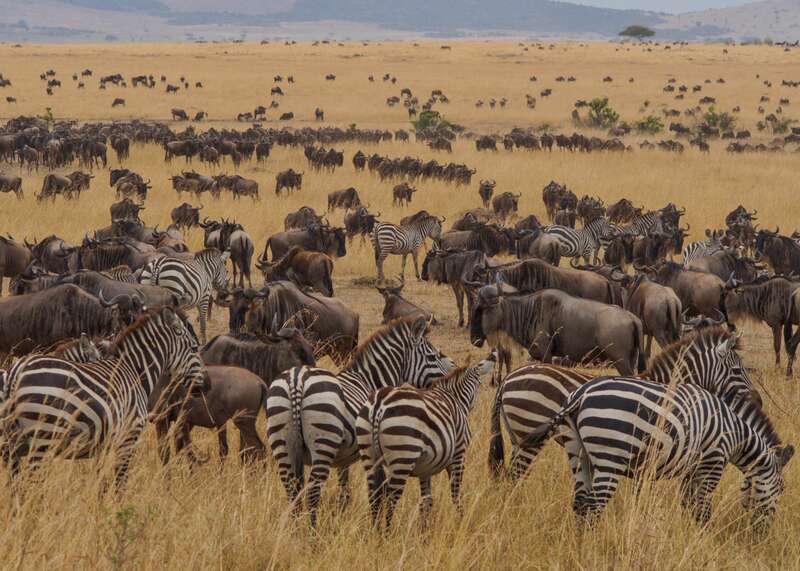 As you get into August, the herds start to cross into the Mara, spending much of August, September and October on the Kenyan side of the Mara ecosystem. This is when you are likely to see the famous river crossings. Not all drive in safaris can reach this area, so if you are expecting to see the migration in these months from the Serengeti side, you may be disappointed, but wildlife viewing is still amazing with or without the migration and there are non-migratory wildebeest too. November and December bring the short rains, this is also an ok time to visit, not too busy and still pretty good wildlife viewing. April and May bring the long rains so most people tend to avoid this time of year but with the rains comes the beautiful greenery. Plus, prices are cheaper! My personal favourite time to visit the Serengeti and Ngorongoro Crater is around January, February and early March during the wildebeest calving, when the migration is in the southern part of the Serengeti and in the Ngorongoro Conservation Area. This is an awesome and very dramatic time when around 8000 wildebeest calves are born every day. This makes the predators go wild, so you will likely see a lot of lions and hyenas hunting, often at the same time. Last time I was there, we saw a wildebeest being chased by hyenas whilst she was giving birth. Don’t worry, she got away. But for how long, who knows. It’s also a bit warmer on the crater rim too, which is a bonus when you are camping. The Serengeti and Ngorongoro Crater lie in the north of Tanzania. The closest international airport is Kilimanjaro International Airport (JRO) which lies between Moshi and Arusha. There is also Arusha Airport (ARK) which serves domestic flights if you are coming from elsewhere in Tanzania. Most safaris start from Arusha (either by road or air), although you can also start from Moshi, it just adds a little bit of extra time on to your journey. You could also potentially start from Mwanza on the other side of the park too, although group safaris are much harder to come by. I have said it many times before that I am not a fan of self-drive safaris. I think in some places, they can be good, but the Serengeti is so vast, that without a good guide, you won’t be able to make the most of it. Plus, you’ll want a vehicle with a pop-up top. If you do decide on a self-drive, you will need a 4×4. There are a couple of petrol stations (the drivers usually disappear at some point to fill up), with one being in Seronera and maybe one near the crater rim (but don’t hold me to that). 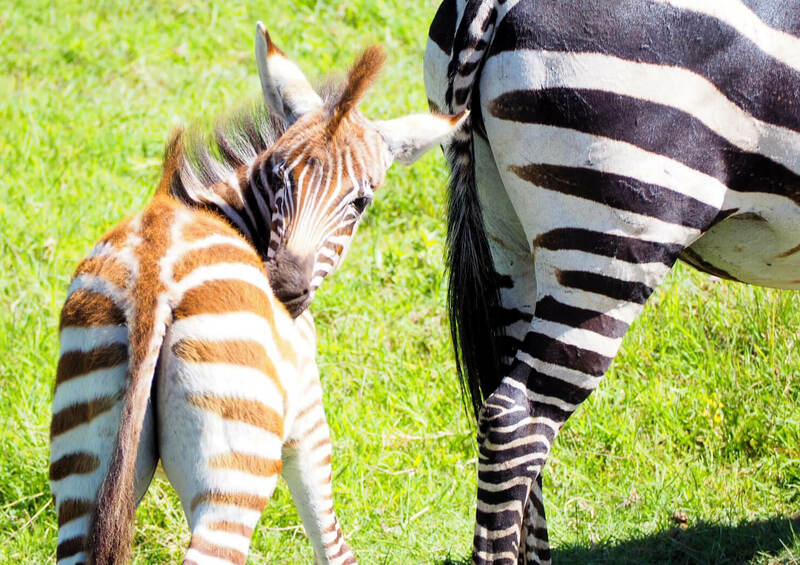 You are best asking one of the safari guides. If you are camping, you will need to bring your own food, cooking and camping equipment. Driving is the cheapest and most common option and your safari company will take care of all the logistics. It takes around 3 hours or so to get to the Ngorongoro Crater and then a further 2 or 3 to get to the campsites within the Serengeti, but usually a bit longer with toilet breaks and stops for permits etc. You can also fly into one of the airstrips within the park. Most flights into the Serengeti depart from Arusha Airport, although there are also some that depart from Kilimanjaro International Airport. You can book accommodation and safari package and flights separately or you can book a full package including flights (more on choosing your safari package below). Some lodges even have their own private airstrips. If you want to visit both parks, you will need at least two nights and three days. 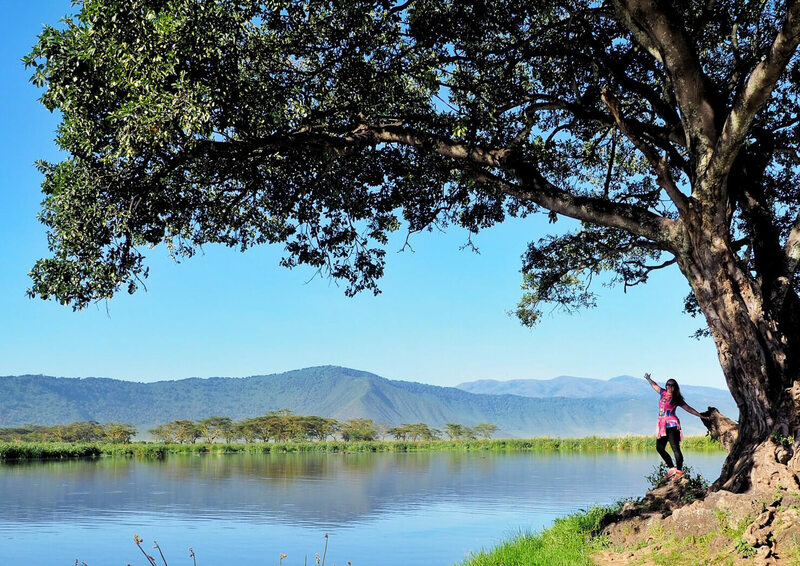 If you just wanted to see the Ngorongoro Crater, you could do it on a two-day, one-night trip from Arusha. After 3 or 4 days on safari, I’ve usually had enough but some people prefer longer, especially if they are staying in lodges with good facilities. If you have more time (and money), consider adding extra days and maybe other parks. Both Lake Manyara and Tarangire National Parks are on the way, so you can easily add them into your trip if driving. Lake Eyasi is also a popular stop and here you can spend time with the Hadzabe tribe. You can discuss this with your safari companies when you are making your enquiries and see what packages they have available. The Serengeti sits in Tanzania, but lies on the border with Kenya. The Masai Mara in Kenya is part of the same ecosystem. The animals move freely between the two countries. The border inside the park is closed, so if you want to visit the Masai Mara too, you’ll have to fly or drive around it, crossing over at one of the other borders at Namanga or Isibania. If you are doing a flying safari, you can easily hop between the parks in Kenya and Tanzania. 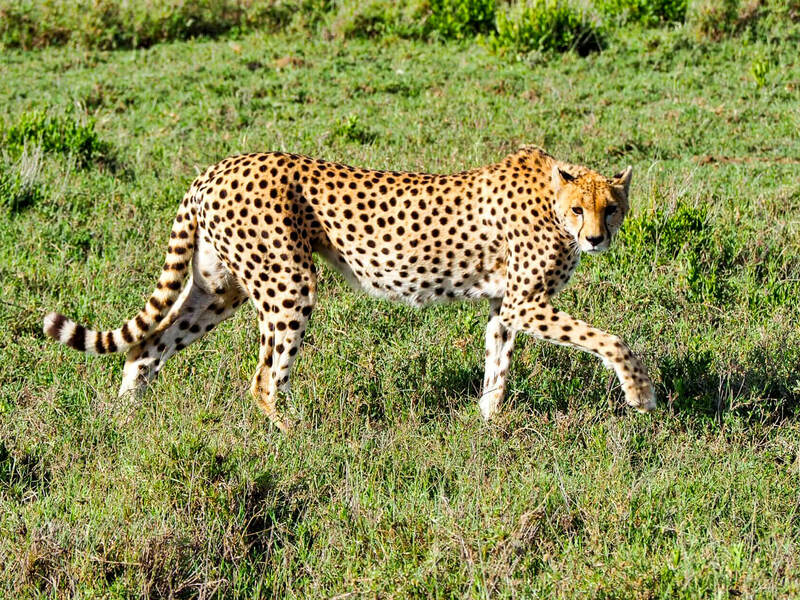 How Much Does a Serengeti & Ngorongoro Crater Safari Cost? Safaris packages can cost anything between $180 per person, per night up to around $1500+ per person, per night. 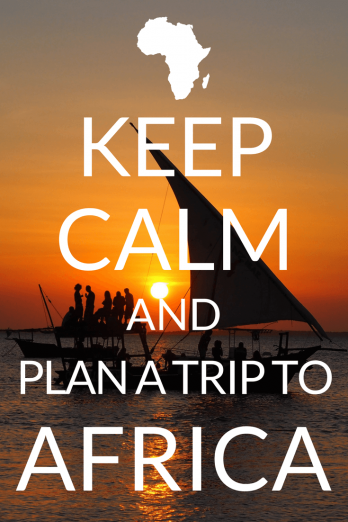 For lodge and accommodated safaris, yes. Especially if there’s somewhere specific you want to stay. If you want to do a specific tour with limited spaces, yes. If you are on a tight time schedule, yes. You could just rock up and look for a tour but you will waste a bit of time doing this and may just have to take what you can get. If you are looking for a budget camping safari and aren’t too restricted on time and can shop around, then no, you don’t have to book in advance. You can just rock up in Arusha or Moshi and book one. There are a few different types of Serengeti & Ngorongoro Crater safari available, depending on your budget and preferred travel style. Most packages are all-inclusive, including games drives, transportation, meals and park fees. Some also include air evacuation insurance too. These are usually drive in, drive out, camping safaris and there are loads of companies to choose from. You arrange this type of safari via a company for a set fee and they will provide a driver/guide and a cook, vehicle, all food, camping equipment and drinking water. You’ll usually sleep in dome tents which you will help put up and take down. Pretty much all budget safaris are drive rather than fly-in safaris and they use a vehicle with pop up tops. Day 1: Leave Arusha/Moshi early, drive to Serengeti, arriving in the afternoon. You would do a safari on the way in, then camp overnight in one of the public campsites in the Serengeti (at night the hyenas prowl looking for food, it’s very exciting). Day 2: Wake up early, have breakfast. Go on safari all morning, heading back to the campsite for around lunch time where you will eat, pack up and then drive to the Ngorongoro Crater rim where you will camp overnight at Simba Campsite (often animals in the campsite – i’ve seen elephants, giraffes and zebra). 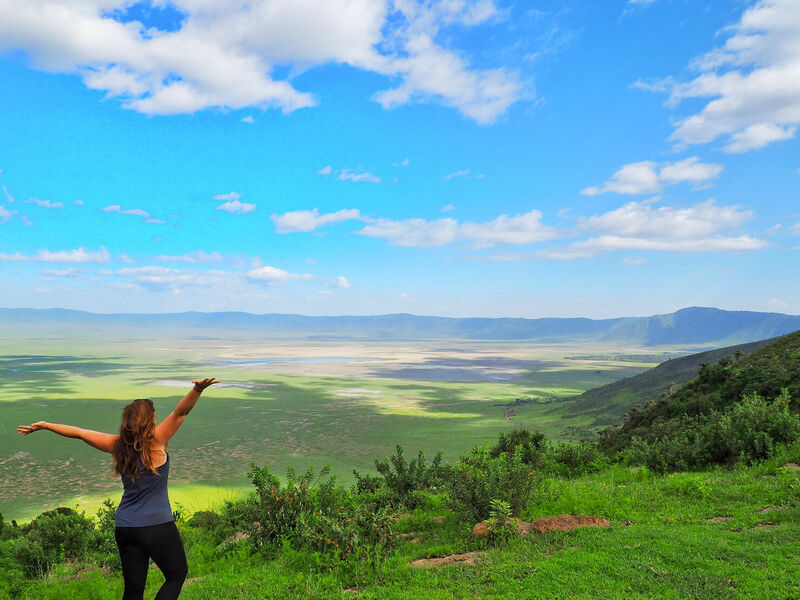 Day 3: Head down to the Ngorongoro Crater early in the morning, go on safari. You’ll head back to the campsite for lunchtime, then head back to Arusha. The public campsites have toilets, showers (sometimes warm), water taps and a building for cooking/eating and the odd plug point but that’s about it. 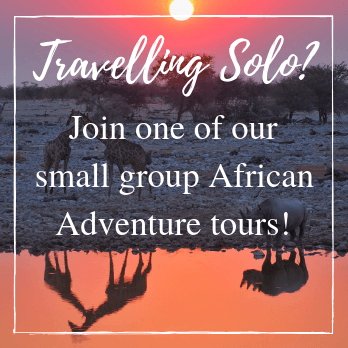 If you are travelling solo, you can either book your own private safari or the cheapest way to do this type of safari is to find a group to join. The more people, the cheaper the safari tends to be. You can either do this by looking at the safari company websites for group departure dates. Or you can email a few different companies to see if they can pair you up with other people. Or you can wait until you get there and book on last minute. The last option is better if you aren’t in a hurry. Many hostels can also arrange trips for you and you may meet other backpackers who you can travel with. You can arrange these as a standalone safari, or they may be part of a longer tour, such as an overland tour or a small group tour, such as one of my Rock My Adventure group tours. 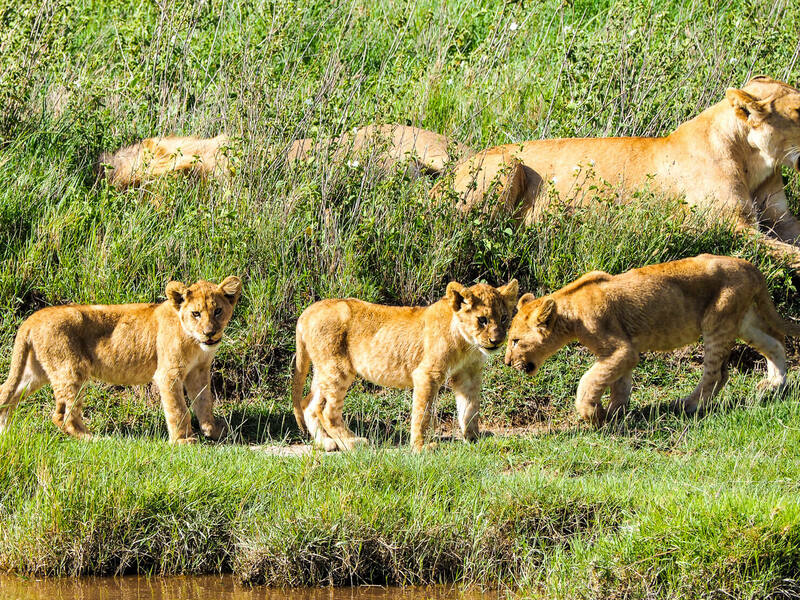 We run trips to Tanzania & Zanzibar, Kilimanjaro & the Serengeti and Kenya & Tanzania – all include trips to the Serengeti and Ngorongoro Crater. We also do a more specialist photographic safari led by pro photographer Matt Estrada. 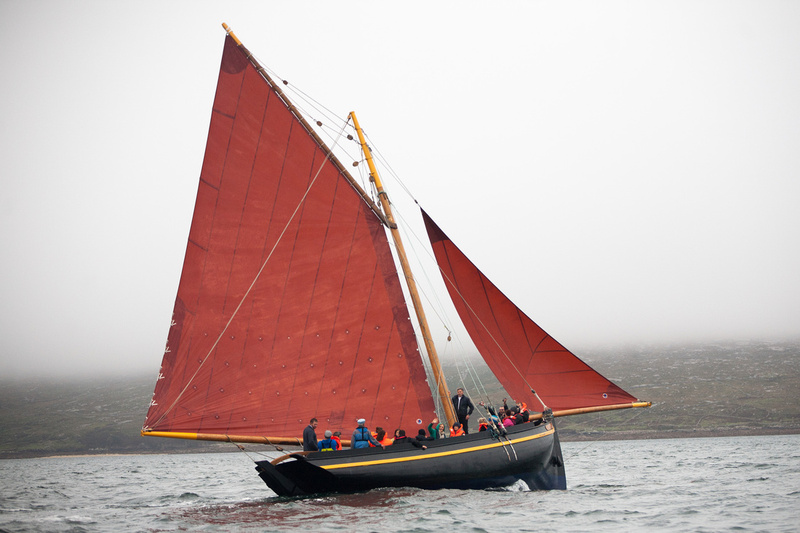 You can read more about what we do and see our group departure dates here. A 3-day budget Serengeti & Ngorongoro Crater safari usually costs between $550 – $750 pp (excluding tips), but you may be able to get cheaper if you are a shrewd negotiator. You could also be quoted much higher, especially as a solo traveller. Most companies offer very similar packages for similar prices but I would cross reference reviews before booking as not all safari companies are created equal. Safari vehicles usually seat between 4 and 6 passengers, with 6 people being the optimum number (price wise) for a budget sharing safari. You can find safari companies on Safaribookings.com or three that I can recommend personally are Shemeji Safari, African Scenic Safaris and Twanga Touring. 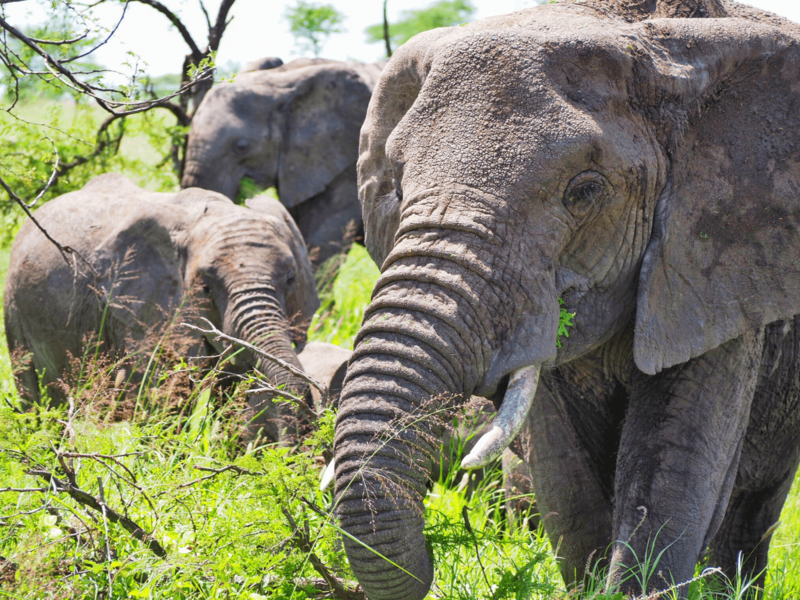 The mid-range safaris tend to be the broadest in terms of pricing. If camping isn’t your thing, then you can pretty much do the same as above (most companies offer various tiers of accommodation/pricing), but instead of camping, you stay in tented accommodation with proper beds or in a lodge. Facilities vary, some are quite basic and some are pretty lovely, with pools and other amenities. Some lodges are great for solo travellers. 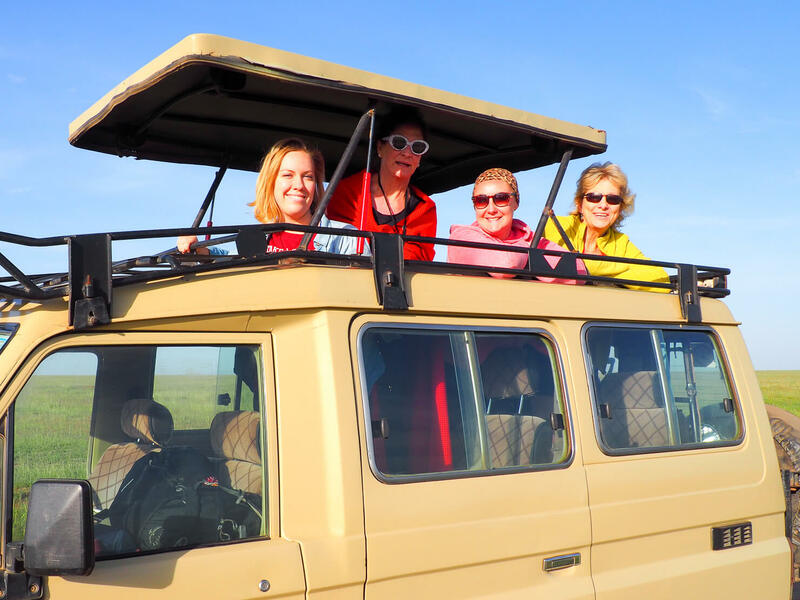 This type of safari usually starts at around $850 for a 2-night group safari (for about 6 people) but can go up to around $2500 if you want something more on the upper end of the scale or if you are a solo traveller or small group. Again, the bigger the group, the cheaper the safari is going to be. 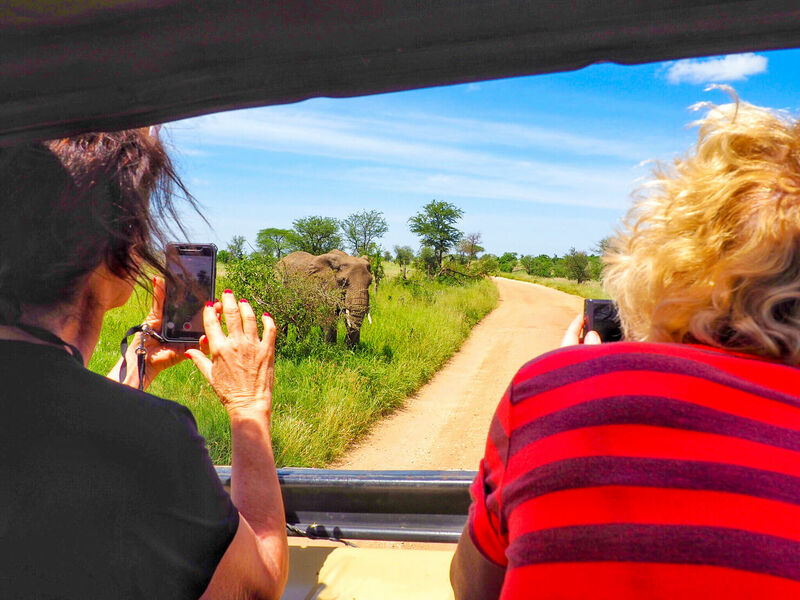 If you’re on a group tour, your safari company will usually suggest and sort out the accommodation, but if you have your own group or a private tour and there’s somewhere specific you want to stay you can always mention that to them and they’ll adjust accordingly. If you don’t want the long drive, you can also fly into the parks. If you book via a safari company, they will drive and meet you there or some lodges have their own safari vehicles so you can book directly with them. Simba Portfolio Lodges and Serena Hotels are two of the most popular upper mid-range options. These are the creme de la creme of the safari experience. Popular high-end companies include the Elewana Collection, &Beyond, Alex Walker’s Serian, Singita and Nomad Tanzania. These tend to be beautiful safari lodges perfectly situated or mobile tented camps that move with the migration, putting them in the thick of the action all year round. The luxury safari packages tend to be longer and are almost always fly-in. Longer because there’s usually a bit more downtime, to relax, enjoy the pool, spa and the beautiful settings. 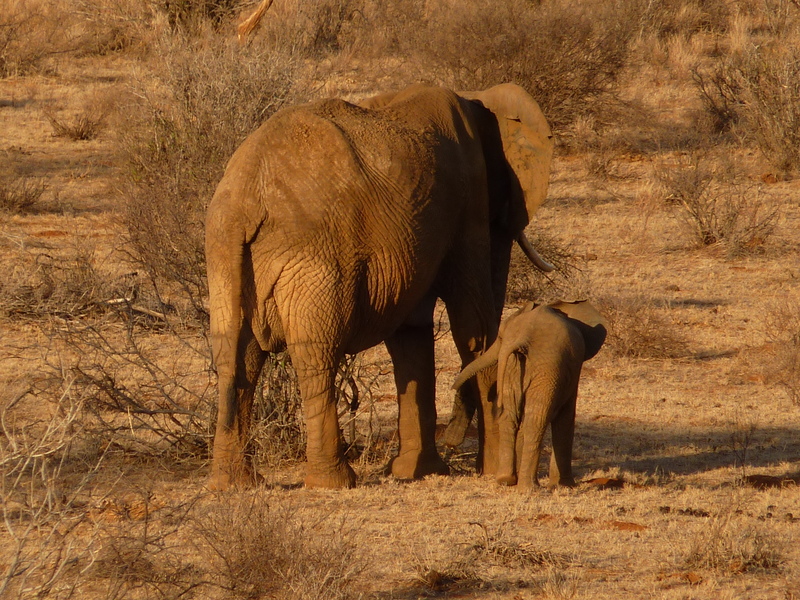 Many also offer other activities such as village visits and safari walks. They can either be arranged via a safari company or direct with properties/companies themselves. As you would imagine, luxury safaris come with a high price tag. A night in Elewana’s Serengeti Migration Camp will cost from around $893 per person, per night in peak season, including meals, drinks and game drives, but not park fees and flights. A Singita double occupancy rooms start from $1495 per person, per night in green season, and $1795 per person, per night in high season. This includes meals and game drives, but not park fees and flights. A 6-day safari Serengeti & Ngorongoro Crater safari with Nomad Tanzania costs between $4500 – $5400 depending on the time of year. Some people love the hot air balloon experience and some think it’s a total rip off, especially if they don’t see many animals. I’d say, that if you can time your hot air balloon with the migration, it’s probably going to be spectacular, like the opening shot of a David Attenborough documentary. If you can’t then just be aware that you may not see many animals and just enjoy the scenery. 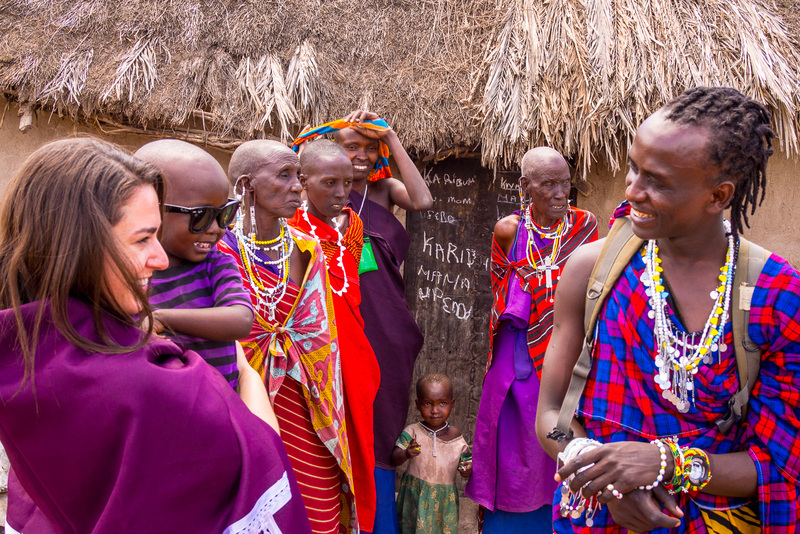 Visiting the Maasai is an experience that is met with mixed reviews. If you are staying at one of the lodges, they often work very closely and exclusively with a local Maasai village and the experience can be really nice, informative and unobtrusive. 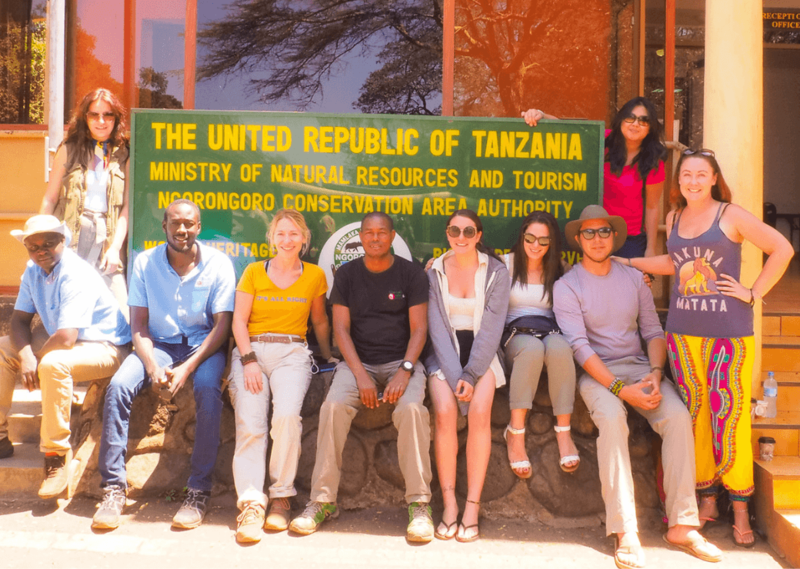 But the majority of safari companies just stop at one of the roadside villages in the Ngorongoro Conservation Area area on the way back to Arusha. These visits are fleeting and it’s always pretty obvious that they don’t really want you there. The singing and dancing feel forced and you spend most of your time in aggressive negotiations over trinkets you don’t really want but feel obliged to purchase. There is a lot of competition amongst these villages so it often feels like they just want as money as they can get as quickly as possible. The general vibe is ‘hurry up and buy something and get out of our village so we can get on with our day’. By the time you are there, it’s kind of too late. I always skip these villages on my tours and arrange separate Maasai village trips to less touristy villages nearer to Moshi and Arusha. Which Safari Should I Choose? For most people, it’s going to come down to budget. If you have the money and want to treat yourself to an all-out luxury safari, go for it. You will have an incredible time. But just know that if you don’t have thousands of dollars to spend, you can still have an amazing safari. 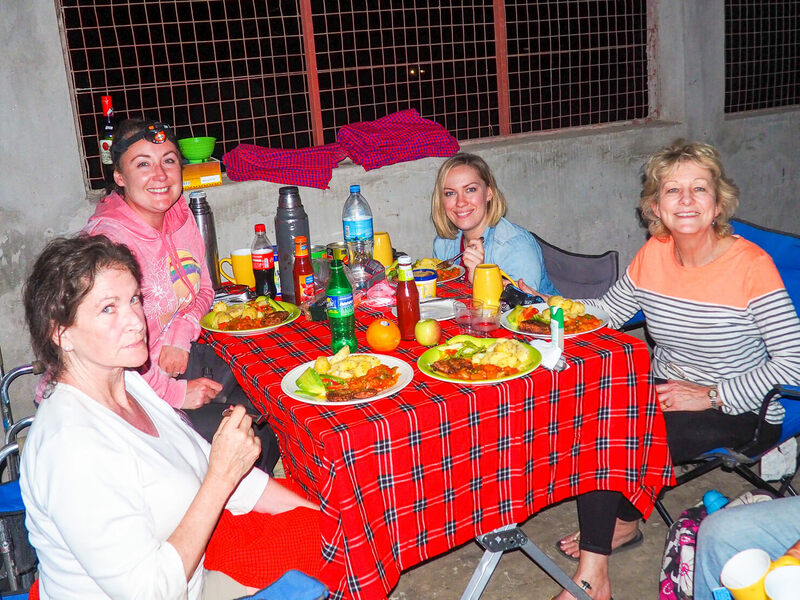 If you go on a budget camping safari, your accommodation surroundings may not be quite as luxurious as others but if you go with a good company and a good guide, your actual safari experience is still going to be awesom and you will see lots and lots of animals. Safaris used to be for the rich or for once in a lifetime vacations. Not any more. Now there are good safaris to suit everyone. 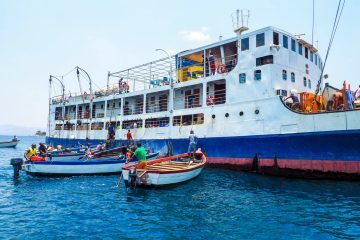 Look at it this way… a 16-night trip through Tanzania (including Serengeti, Ngorongoro Crater, the Usambaras, Moshi, Arusha, Zanzibar and everything in between) with Rock My Adventure costs much less than a 4 or 5-day luxury safari. We always have incredible guides and we always have an AMAZING time! If you’re on a budget camping safari, you won’t get much in the way of ‘extras’. But there’s a lot to be said about the simple pleasure of drinking Amarula and toasting marshmallows around an open fire, whilst sitting on a slightly uncomfortable safari chair and listening to hyenas nearby. It’s all part of the adventure, hey? 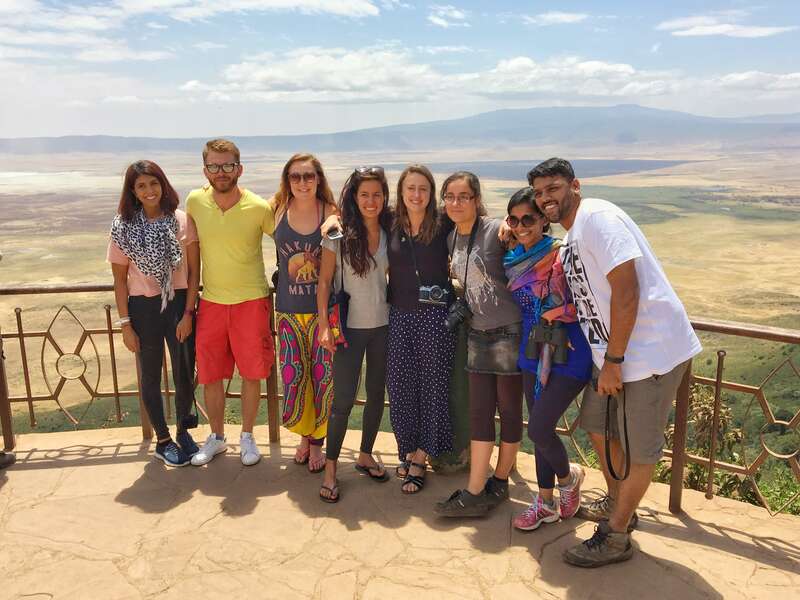 Tours: Want to travel to the Serengeti and Ngorongoro Crater with an awesome group of like-minded adventurous travellers? Then join a small group tour and come on one of my Rock My Adventure tours. I hope you have an incredible trip to the Serengeti & Ngorongoro Crater. If you have any questions, please leave them in the comments below! 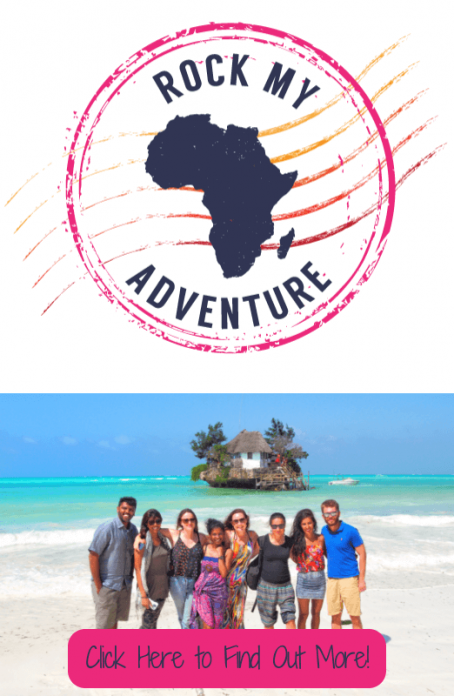 That fancy Nomad Tanzania 6 day price is per person, right? If I want to do that solo they will tack on a high single supplement, right? 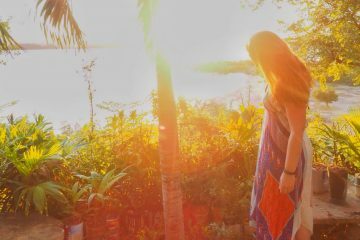 Is there a company upper midrange that caters to solo travelers? Yes that’s per person. I’m not sure on the single supplement, you’d have to check with them when you make your enquiry. Such a great post and timely, too! I’m planning on doing a safari in September this year. I know I want to do one that combines Kenya with Tanzania. I’ve only just started researching and it’s daunting between all the companies, options, prices, reviews, etc. So I’m definitely going to check out some of the sites you recommended. Many thanks! Thanks April, that’s awesome! September is a great time to go! I went on safari in Tanzania last summer and your information is great. I wish I would have known all of this when I was preparing for my trip. I went on a combo trip with both safari and climbing Kilimanjaro with G-adventures. I highly recommend visiting the Serengeti & Ngorongoro to anyone that can make it happen. Happy travels! One of my dream trips is a safari! Seeing animals in the wild just doing what they do is so unreal to me! Of course it’s not cheap but knowing the different options is really helpful! I didnt realize though the price could vary so much. I just thought it was superrrr expensive no matter what! Thanks for sharing! Thanks Lauren! There’s so much choice! Hope you get to experience it one day!!! 🙂 Thanks for reading! 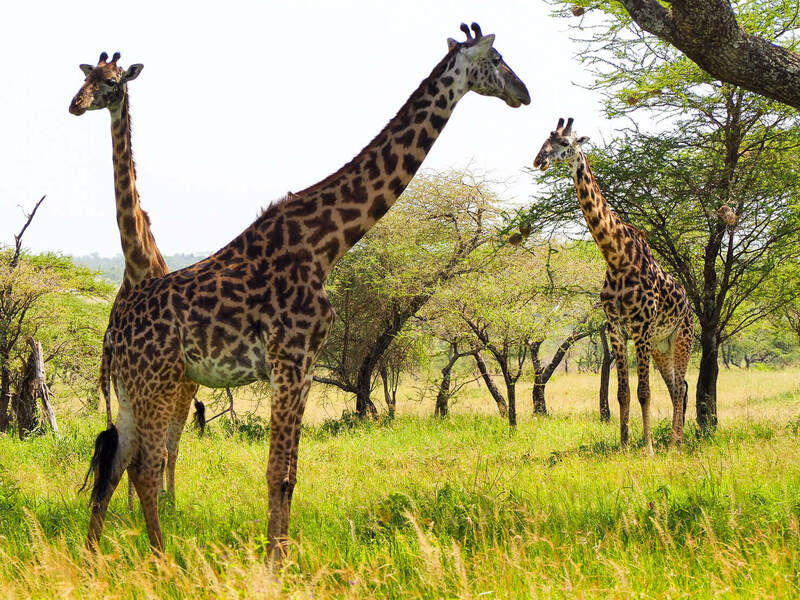 Indeed an insightful article about Tanzania, a country with abundant wildlife riches coupled with an infectious diverse culture that can be discovered on a solo or small group tour. I wanna experience safari too!!!! I wanna see wild animals in real life too! I can’t wait to experience my safari with my wife. So great i found this post. Interesting, Helen! I never knew that there was a “high-end” version of a safari trip. Nevertheless, I’m always ready to experience wildlife no matter how high-end or budget friendly it is. There’s nothing like this anywhere else!